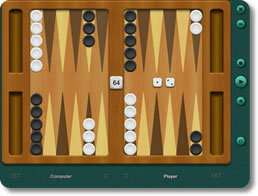 Backgammon Classic Game - Download and Play Free Version! 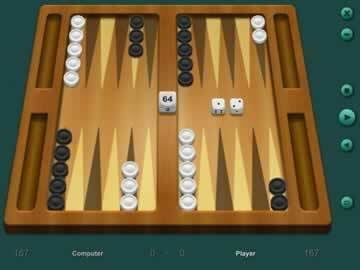 Outwit the Computer with Skill and Strategy in this Excellent Backgammon Game! Backgammon is a game that has been played for thousands of years in many different cultures. Researchers even believe it may have been the first board game ever played. Now this game with such timeless appeal has evolved into a computer game that combines everything the world loves about backgammon with new enhancements designed to up your skill to the next level. Backgammon is a board game for two. There are two different colors of checkers representing two different players, and each player has 15 checkers apiece. The board is divided into four quarters, two belonging to each player. Each of these quarters contains 6 different points. Each player has both an inner board and an outer board, and the objective is to get all of your checkers to safety by moving them first to the inner board, then off to the tray. This is called "bearing off" in backgammon. Both players have the ability to block their opponent from entering the inner board, and this is where the strategy comes in. Whoever bears off all their checkers first is the winner. Most matches are worth 1 point, but there are a variety of different ways to up the point value. Have fun doubling, redoubling and gammoning your way to the top! Like chess, backgammon has been the subject of much research and programming by computer scientists. As a result of these efforts, computer players are now capable of providing a worthy challenge to even expert backgammon players. The robust AI of Backgammon Classic will double, redouble and bear off like an old pro, meaning that backgammon fans now have easy access to thrilling matches that will sharpen and hone their gaming skills. This ancient game is now better than ever thanks to the new format! Backgammon Classic is all the fun of traditional backgammon with a modern, computerized twist sure to please any fan of this game. The pieces and boards look top notch with excellent graphics and sound, but where the game really shines is the complex array of statistics and history that make analyzing your gameplay quick and easy. Odds, average dice, maximum pips and much more are all at your fingertips. Backgammon Classic also supports both Jacoby and Crawford rules. Record your best games and play them back again and again. Have a particular board layout in mind? Load it into the built in game position editor and see how it all plays out. Save a game and pick it up again later. Switch between 2D and 3D boards. Choose between slow, medium, fast and instant game speed. With loads of options and features, Backgammon Classic is backgammon your way! Whether you're an old pro at backgammon or a newbie looking for an effective way to learn this beloved board game, Backgammon Classic provides an inexhaustible source of challenge and excitement!